New guidelines from the British Journal of Sports Medicine(1) recommend getting up and moving about for 2 to 4 hours of your workday to reduce (or prevent) back and neck pain, as well as reduce the risk of serious health conditions like diabetes. Create an intelligent posture environment that’s smart for your body, and how you work. 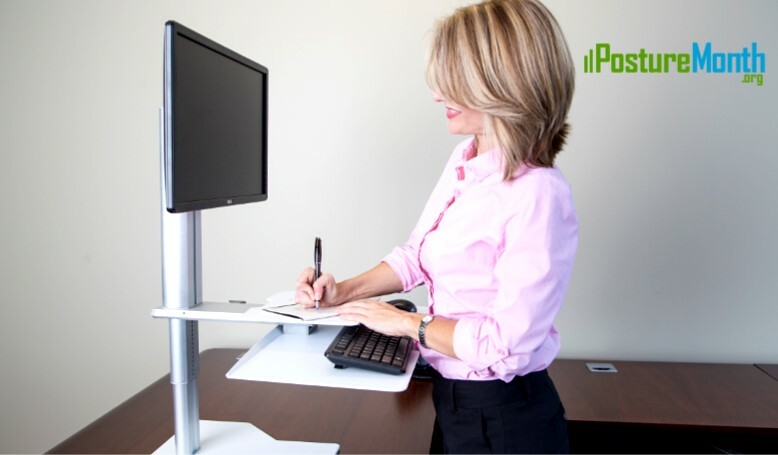 Existing workstations can become a more activity-friendly work environment by using a variable height desk like the Sit2Stand from PostureMonth.org sponsor Uprite Ergo. The key is making it easy to change positions and alternate between sitting and standing multiple times throughout the day. Many find when working with a height adjustable desk in the extended standing position they are more often to “travel” more throughout the day… whether that means walking to a coworkers office rather than emailing, or taking care of tasks away from their desk as they come up rather than allowing them to pile up. Adding a little exercise through your day can make difference in burning calories, keeping your joints moving and reducing muscle stress and tension in the back and neck. Look for 5 ways you can add more movement into your workday. Write your suggestions for yourself on a sticky note because it’s easy to forget good intentions when we’re on work auto-pilot. Can you walk down the hall to have a standing meeting with a colleague? 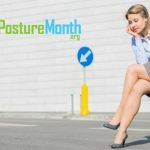 Will you take a posture break every hour? Did you set an alarm to raise or lower your variable height desk?